The flag of the United Nations consists of the official emblem of the organization in white placed centrally on a light blue background. It was adopted on 20 October 1947 with the adoption of the Resolution 167 (II). 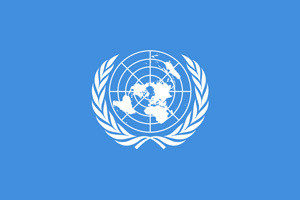 Ever since the formation of the United Nations in 1945, the need and desire to create a flag that would symbolize the organization were imposed. Thus, the United States Secretary of State Edward Stenetius, Jr. as a chairperson of the U.S. delegation formed a committee, headed by architect Oliver Lincoln Lundquist, that developed the design. The olive branches symbolize peace, while the map of the world represents all the people and the countries of the world. The white and light blue are the official colors of the United Nations and symbolize the hopes and dreams of people the world over for peace and unity.